Things have been very hectic this semester (in a good way), and consequently, a number of things have lagged behind. One of which is my attempt to aggregate all the good discussion and activity around my “What is Science Literacy?” session at this year’s scio14 conference. Anyway, with a bit of pushing from Emily Buehler (courtesy of the folks at scio14), here is what is available. I’m of the opinion that it’s worth checking out. Some of the comments are fascinating (you can download the pdf of the online survey responses here). Also, if you feel like leaving your two cents, you can still participate in the survey itself, and I can update this document accordingly. This session aimed to explore “scientific literacy,” and how this concept can inform science communication efforts. It attempts to survey and address the challenges that come with a term that inherently sounds vague. Part of this is due to the concept itself being always in a state of relentless change – which has a lot to do with differing opinions from academics and on-the-ground experts; as well as the current information ecosystem, with its media challenges, a shifting science culture, and also (unfortunately) because of the subversive activities from the likes of L.P.W.L.T.B.L.’s (loud people who like to be loud), P.W.S.P.O.M.I.’s (people with strong political or monetary interests), and of course, the D.C.D.s (dangerously clueless douchebags). In all, the session will provide a guided outlet for folks to share their opinions and expertise on this topic, and whether such techniques are useful (or not) in a variety of settings (i.e. journalism, education, PR, advocacy, policy). Note that the session began with a 6 minute Pecha Kucha, presentation that provided a summary of common elements in scientific literacy. 1. knowledge of the scientific process. 2. context-driven knowledge of a subset of scientific/technical facts. 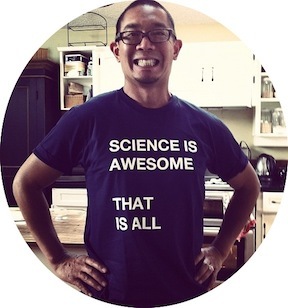 3. appreciation of science culture and how it interacts with other cultural perspectives. In this instance, David made introductory remarks by recounting an interaction he had with an inquisitive elementary school student. Here, the dialogue between David and student focused on three questions on the subject of unicorns. Q2: Could unicorns be real? Q3: But, what if you saw a unicorn leap over a rainbow and make glitter? A1: There is currently no strong evidence to support this. This is an answer that pays homage to the scientific method or the process of science. This also leads to discussions with how society generally obtains information (media consideration, as well as elements of biological and social behavior). Basically, public needs to know that you don’t have to be a scientist to see merit in thinking like a scientist. A2: It depends. If we are talking about what is simply a horse with a horn attached, then this arguably could exist. If, instead, we are referring to a unicorn that can make glitter from air and leap (in a single bound) over rainbows, then we would argue that such a unicorn could not exist. This would be very unlikely as such a unicorn would be breaking any number of scientific physical laws (i.e. 1st law of Thermodynamics being a good example). More importantly, this question segues into a facet of scientific literacy that considers the notion that involves knowledge of lists of technical facts. A3: The frank answer here is that you would probably freak out. In other words, if strong evidence existed for such a fantastic unicorn, then one only has to imagine the historic significance of finding the existence of such a creature. Now try imagining the drama, the personalities involved, and perhaps most importantly, the scientific “creativity” required to make sense of it in existing frameworks of knowledge. All to say that science literacy is not just limited to the “process” or “technical facts,” but rather it should include a “science culture” angle, whereby it’s evident that science participates in society in a variety of perspectives. For example, other perspectives worth noting include those concerning politics and ethics. Note that discussion was framed around a set of questions. Below are collected thoughts from the actual discussion, as well as answers recorded via an online survey of contributing scio14 participants. A pdf of the survey can be found here. Note that interested science communicators can still participate in the survey here. The majority of the session attendees do, and all survey participants (n=16) also do. 3. If you do see merit in this mode of thinking (and even practice it), is there a sweet spot of content delivery that you find works well? There is a sweet spot of content delivery. Finding and delivering it is an inherent challenge and a big project. The journalist increases the reader’s interest. Share your passion in the story. Find the sweet spot by including things that the readers don’t know, finding an angle where the science makes them see something, and teaching them something to think about. Scientists say that we should not have people in a story about science. PIO’s try to get scientists to talk, but many shy away if the article is about them. Who is this “general public”? Think about scientific literacy for __________. Think about the “who.” The audience changes depending on the content. How much do you know about your audience at any given time? Working with a non-profit: it’s a moving target with no best practices. Pop culture influences can interest people. For example, “Finding Nemo” caused aquarium visitors to engage and ask questions. The “Mermaids” documentary/mockumentary: many people believed it was real. Using this video and the public reaction to it could be a strategy to debunk the media and to start a discussion and questioning. For me, the sweet spot is focusing on process and approach to thinking. It works well to demystify and explain science as a human endeavor, in such a way that my listeners feel they could possibly have done the work themselves. Also works well to include elements of critical thinking/information literacy in discussions of science news or articles. I try to leave out the process and focus on the ‘facts.’ I would like to shift more towards the process but this requires a conscious effort on my part. Start from introducing science as a way of knowing, equal in weight to other ways of knowing. I’m sort of stuck on this, as I’m not sure who the target of the “framing” is in the previous questions. Framing for who? The audience for the stories? The people who run ScienceBlogs? My faculty colleagues/ administrative superiors? My publishers? Myself? I don’t really pitch what I do on the blog as “increasing science literacy” in the sense of telling the audience that that’s what I’m doing, but if you asked me to justify spending time blogging, I’d probably say something along those lines. My books are a little more explicitly aiming at increased scientific literacy, some more than others. The “sweet spot” in terms of content is different in different media, and in different subsets of what I’m doing. If I’m writing about a new experiment published in a journal, the target level is different than if I’m writing about something I did myself for the purposes of posting about it on the blog. There’s yet another level for history-of-science pieces, and still another for academic-culture stories, and so on. In other words, this isn’t a well-formed question. I’m currently working on story boarding a video series that will hopefully be my sweet spot for this kind of content. I haven’t gotten to the point where I can determine if it has worked well or not. But who knows? I see science literacy more as an understanding of the scientific process than necessarily conveying facts. I need to incorporate it into the story, but if there is something unique or revealing about the process that I can incorporate into the existing story. Such as the finding coming about from an unusual collaboration, or an unexpected fortuitous discovery. The sweet spot from a librarian perspective, is balancing practical lessons on how to use the catalog, how to use scopus, with discussion on why these critical thinking and research skills are more important than for just finding articles for their papers, it’s about learning how to evaluate any information they come across, and learn to recognize, analyze and process information (plagiarism, peer review process etc). Something that’s fun and engaging/interesting is usually what works well. That would all depend on context. The most necessary thing is to make the subject relevant to the audience, and if not relevant, at least interesting to them. Presenting real examples that students relate to and giving them the opportunity to identify misconceptions or limitations of their thinking. Music. Talk about science using sing lyrics as analogy. (Connecting science to something most people like and defining terms around it). Enough background to clarify the topic without unnecessary side discussion, with reminders of things readers may have encountered and pointers to more info as appropriate. Content delivery is about wrapping the science up in a story or having a personal perspective to draw in the reader(s). It’s *never* about dumbing things down, but rather being clear and careful with terminology. I also think science literacy is (or should be?) more about the process of science rather than an end-point. In our narrative work we explicitly set the line at, “Any exposition must be in service of moving the plot forward.” The corollary is that we look for stories where some bit of science is essential to driving the plot. 4. In the same vein, what are the inherent challenges associated with finding or being able to deliver this sweet spot? The biggest challenge is conveying thought processes that have become inherently more intuitive to me through science training into a clear explanation that can be understood by someone else. Having to define many terms without it turning into a text book. Losing the story by getting the details straight. The biggest challenge is time. I have a day job with teaching and administrative responsibilities, and two small kids. Finding the time to refine material to exactly the right level is the biggest challenge. Getting learners to disavow preconceived notions of what science is. Yes. For me, it’s drawing people in with photos, video, graphics or other illustrations without confusing or distracting them. Generally being able to fit it into the story without sacrificing the story. And keeping in mind what a reader is actually going to want to hear and be able to absorb. I don’t teach a semester long class, I usually only get one or two lessons within the context of a semester. I need buy in from faculty to make sure students take my lesson seriously and I also need to make the lesson interesting, which is HARD, I try to convey my passion about it but students often just give me the blank stare response. So I am constantly trying to find relevant pop culture type example,s to get their attentions. Working out unexpected or unforeseen relevance. The lack of scientific scrutiny in pop culture/media/general public. The misconceptions can be heavily ingrained and reinforced continually. Changes with audience. Audience is unpredictable. Most notably, providing enough info without providing too much, respecting readers without talking over their heads, and trying to focus on the most relevant context. Avoiding jargon. That is absolutely key. Also, big challenge in describing/writing about areas of science that don’t have an easy ‘catch’ for an audience. It’s easier talking about monarch butterflies because everyone can relate to butterflies. It’s much harder to discuss the process of, for example, epigenetics. 5. Is there a particular area of science literacy that is missing in the general public (process, facts, science culture)? Why is this and how problematic (from, say a civics point of view) is this? The broad public misses that science is a human endeavor and that it is not infallible. Knowing this allows people to accept conflict without anxiety. As a journalist, you don’t have the space to give the story and all of the information. You must use certain tactics for certain approaches. The teaching is that science is linear (which starts early in school.) We must help to illustrate that science is messy. The culture of science interacts with other cultures. But in some ways it can be exclusionary. Do we build a wall that pushes others out? We want people to think like a scientist (without it being necessary to be a scientist or to be in the scientist culture). Imagine substituting “music” for “science”. Is it getting worse? Undergraduates are entering university lacking a number of skills including science literacy. Not understanding the process of building knowledge through the scientific process as a cultural construct distorts how people interpret the information they receive. It is very problematic as the flaws in critical thinking this reinforces impact decision making in all fields. The process and culture aspects are most often missing. General public science discourse has traditionally focused on technical facts. This can make science seem dry to some. It’s very problematic that many citizens lack a basic understanding of what science is and does. Schools and informal science education environments both need greater focus on how we know what we know. Terms related to process and science culture. Elements concerning science culture is the least known in my opinion. Mostly because the science world is insular and those who are not science literate have no desire to learn about the culture. The process is probably the biggest point of confusion. That science is more than fact and the difference between fact, theory, and law. Problematic because we can’t converse about science unless we are all using a common vocabulary. I’m sure there is, or we wouldn’t have people who don’t know that the earth revolves around the sun. Hugely problematic, and I think the solution is catching these folks when they are young and creating an interest in being scientifically literate in elementary school. The process often is left out. In some ways it’s inside the baseball. The general audience doesn’t necessarily have to care about this, so the challenge is finding ways to make it a relevant story that people outside of the bubble have some reason to care about. Science culture is hard to get into and hard to leave. I grew up in it, it’s a privilege I often forget I have. I think it’s human nature to be comfortable in their privilege and to move out of it, whether it’s inviting others in, or stepping out of your zone. Change is hard! It’s an issue for populations that need the science! And it also means that we are possibly missing chances to gain perspective from the benefit of diverse minds. I think being online and technology are greatly increasing access and spread of information, but we need leaders and groups who are making an effort to be sure globalization of information is not only free but fair. Education is the best way, but this has problems of its own – mostly because the US has lots of education. Disconnect about value, cost , usefulness of research in bigger picture. Loss of meaning in smaller stories. Loss of threads… Connecting to related content. Yes, there is. Neuroscience and psychiatry tend to be under-reported, since these areas are enormously complex, even for those who consider themselves very scientifically literate. It is very problematic. Take for example the very widespread public ignorance about dementia, and the myths surrounding it, ignorance shared by many medical professionals. Yes. School curriculums mainly focus on content of science and little on the inquiry of science. Also, the inquiry aspects should be included in most other core subjects, if only as a way of scrutinising knowledge within that subject. Very problematic. The media should take some responsibility in promoting critical thinking. The process overall. People don’t broadly understand why the process lends to credibility. And when the process is misunderstood or undervalued, science can seem unproductive or lacking in credibility. I think process & culture are more or less completely missing. No one reason — harder to describe, of less practical import to people, less obvious emotional impact (vs. smoke causes cancer, say). How problematic? Somewhere between very and not at all? Reasons it’s a problem are talked about a lot. Reasons it’s not a problem — or rather is maybe unsolvable: there are a *ton* of things you could potentially expect people in society at large to know. What’s the culture of art curation? The process in international manufacturing? It seems impossible that everyone could know all of them. Perhaps science writers focus to quickly on asserting the findings without identifying the conditional nature of those findings. Without an understanding of uncertainty, and more specifically, probabilities, the civilian lawmaker or voter will tend to see issues as two sided, yes or no, good or bad, not relative and adjustable. Fundamentally, there are just not enough scientists entering discussions with people outside their own area of expertise. 6. If you don’t communicate science with a strategic view to “increase scientific literacy”, why not? Or put another way, what might be the detrimental effects of overanalyzing this facet of science content delivery? You are trying to engage readers, not to promote science literacy. Reading is the base level. Not every project requires science literacy. It depends on the goal. Literacy is very important, but it is also important to convey the joy of a scientific approach to questions and the human-ness of scientists. If the goal is one of the latter two, then always placing a focus on literacy may detract from the effectiveness of the piece, potentially in relation to both goals. It is most important, first and foremost, to engage the reader/viewer/student. You spend too much time analyzing ill-formed questions and don’t do any actual communicating. I don’t think that everything I do tries to increase scientific literacy. I think it’s easy to give excuses like “not every story is strong” or “as communicators we are being asked to do too much with little resources” but when it comes down to it, we have to make an effort in making this kind of thing a priority. I think there’s a danger in trying to make the communication so “perfect” — from an accuracy or literacy point of view — that it eventually becomes something that no one wants to actually read. I usually think over analyzing can feed into burn out and the loss of ‘fun’ in what people are passionate about. You might be dumbing down the content. Spend too much time explaining or defining rather than telling the story. Nobody likes to be talked down to. Treating all writing as “teachable moments” may sound a lot like preaching. Furthermore, arguing a point with straight facts and logic often helps to solidify the listener’s point of view as they review their reasons for believing what they do. Rather than simply focusing on “increasing literacy,” writers might consider ways to share stories in a way that increases empathy with scientific perspectives. I always communicate science with a view to increase scientific literacy. I see very few detrimental effects *except* the scientists must have his/her credentials – in other words, the science communicator has to have a program/background that provides real credibility. It gets in the way of other goals. We’re trying to do an exploration of what it means to be human in a scientific world. Putting in literacy goals will distort that. Of course, that doesn’t mean literacy-aimed projects can’t be all good. They might be bad, for exmaple, if the focus is on how stupid people are for not knowing things. I think that approach does a lot of damage. 7. At what point does considering scientific literacy become a stepping stone towards science advocacy? Is this a bad thing? Or, in other words, is it for everyone? Should it be for everyone? Literacy is how you intellectually access scientific thinking or awareness. If I encounter information and I question it, where do I go? How do I be a skeptic? Would it be interesting to discuss scientific literacy in an unconventional format (such as a debate or a guided game)? Literacy and advocacy can exist separately. Advocacy without literacy is potentially damaging in the long run. Literacy should be paired with material to also present the process as joyous. Science as a career or hobby isn’t for everyone, but everyone should have a basic “science appreciation” — an understanding and appreciation for what science is and does. Science absolutely is for everyone, or should be. I say advocacy is good – it means we are passionate about what we say. It should be the basis for communicating science, not the other way around. I think it’s hard to separate the two. But no, I don’t think it’s a bad thing. It doesn’t need to be for everyone. There are many different types of outlets and stories, they don’t all need to be doing the same thing. Everyone plays a part, and it’s good to be cognizant and be an ally. But there is also the risk of having too little information, and hindering instead of helping. I also think sometimes it feels like a responsibility which has been placed on you rather than something you volunteered for. It’s a personal choice to be an active participant, but I also think if you aren’t going to take an active role, you should be willing to be open and help ‘spread the word’ when asked to be a support. The problem is not so much science advocacy, as unconscious fallacies in it, such as appealing to a mythical objective morality in the guise of science. Scientific literacy in societies in general has been increasing constantly since the dawn of humans. It seems there is no other way and if there was, ironically, it would be a scientifically literate society that finds the other way. Unless, of course, we follow a N Korean model (which we did in some way or another). Therefore, the question of advocacy as a negative thing is only relevant when talking about specific scientific issues (especially politically charged ones). It is science policy from the moment it conveys a need for something. Not bad. But not for everyone. I suppose it’s a bit naive to operate as if a reader must understand the context and background of every point to qualify as understanding anything at all. If using stories can elicit empathy, writers may find it possible to share science without ensuring, or insisting, that the reader will become literate. It’s not for everyone because not everyone has the right skills for all forms of communication, but those willing to enter this discourse should and should be supported in doing so. But too few people do… and that’s a problem. E.g., it’s ALWAYS the same 2-3 profs in my Department doing this -we need our peers to take part more actively. Haven’t thought much about it. Based on the thoughts above the answer to the last question is probably no..
8. How does the literature in PUS (public understanding of science) help you become a better communicator? (Or does it even?) How does it compare to other tactical devices? Are there defined metrics that allow analysis of the utility in different scientific communication methods? There is a scholarship to teaching and learning. Talk to your librarians. They are passionate about literacy and can connect you to resources about literacy. I’m not well familiar with PUS research. In my limited familiarity, I have found discussion of PUS to be very thought provoking about my approach. I am not familiar with this literature. I’m not familiar, but I would like to be. The PUS literature can be very helpful indeed – but then so can too a study of rhetoric and the history of rhetoric, or the history of narration.. Sorry, have to leave this blank. It doesn’t for a very frustrating reason. All the journals are closed access, so I almost never read them. I honestly think this is the biggest barrier, by far, to the theory-> practice movement. The articles need to be available, or a lot more translational work needs to be done.